Process gases – produced through other processes. Pioneered the first commercial oxygen plant in the 1920s. Pioneered non-cryogenic air separation in the early 1950s. Introduced the patented CoJet technology in 1997, a revolutionary means of injecting oxygen and other gases into electric arc furnaces (EAF). The process has since become a standard for chemical energy input in EAFs. The dark shadow plaguing the company is its history before 1992. Praxair was spun-off from Union Carbide, the company partially responsible for the 1984 Bhopal tragedy, considered the world’s worst industrial catastrophe. The company plans to achieve annual organic sales growth of 8-12% and generate 12-18% annual organic EPS growth. 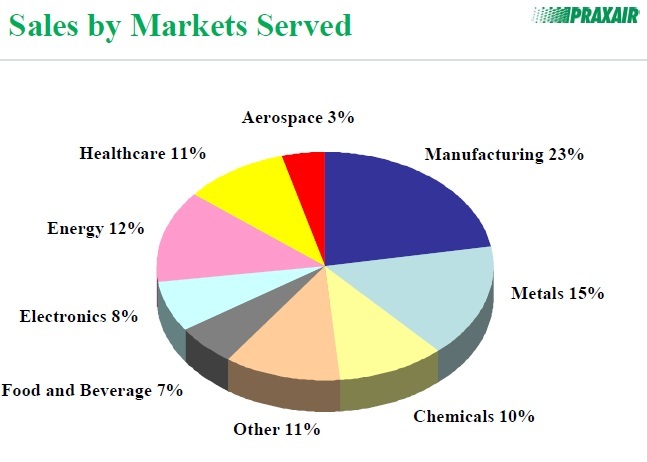 Of this, base business is expected to follow industrial production and achieve growth of 3-4%, applications and technology transfer to contribute 2-3%, and on-site project backlog at 3-5%. Among these, the on-site project backlog has the best visibility while the other two with their included dependencies imply associated risks. Overall, the 12-18% long-term EPS growth projection seems overly aggressive; given EPS growth was just achieved last year from cost-cutting measures. Praxair has significant debt. Good cash flow well above what is needed to service their debt obligations is generated. The debt-to-equity ratio stands at 0.85, which is not excessively high compared to peers. Nevertheless, it entails trouble should business unexpectedly slack off for the company. Infrastructure development and domestic consumption increases in the emerging economies. Shift to hydrogen as an energy source. Enhanced oil recovery initiatives that use Praxair’s products as a raw material for injection technologies. 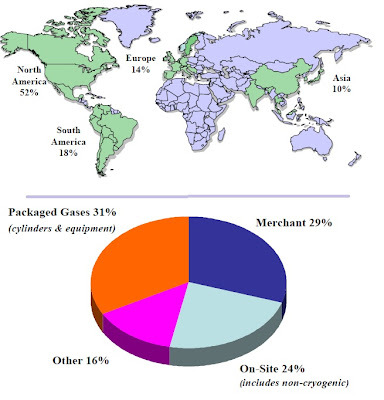 Coal gasification initiatives to derive chemicals out of coal require Praxair’s products. Alternative bio-fuels are resource-intensive compared to the use of gases Praxair produces. 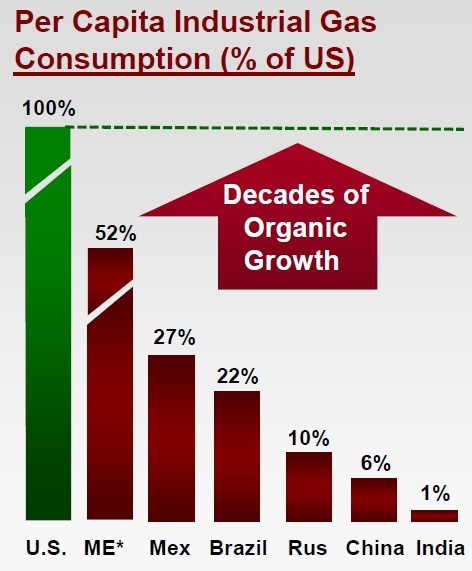 These initiatives are expected to act as growth drivers to support their annual sales growth target of 8-12%. Last year business dipped substantially in the wake of the global recession - Revenue fell 17% yoy but amazingly the company coped to grow earnings as the net profit margin improved yoy by an outstanding 275 basis points – the impact of a one-time tax event buoyed the effort. Still, this is incredible execution by its executive management team. PX scores 7.25/10 on its ability to beat inflation: Return on Equity, Net Profit Margin, Free Cash Flow are all almost perfect. PEG ratio, a measure of valuation is however very rich at 1.86. Corporate Abuse rating is 0/10 as their executive compensation is egregious: The CEO makes around $8M, over 250 times the average worker. 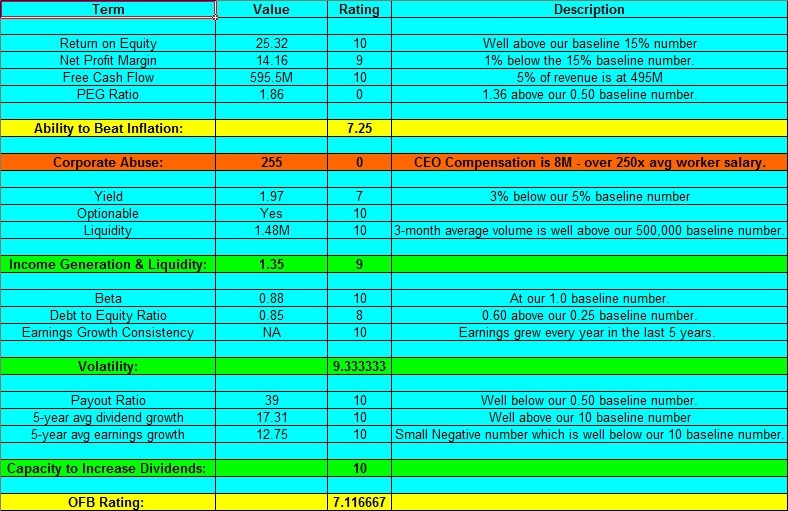 Income generation and liquidity measure is almost perfect at 9/10: PX pays a decent 2% dividend. The stock is also Optionable and very liquid. Volatility ranking is also almost perfect at 9.33/10: the company has sizable debt and that reduced this rating slightly. Capacity to increase dividends scored 10: the company grew earnings steadily in the last 5 years and earnings showed consistent growth history as well. 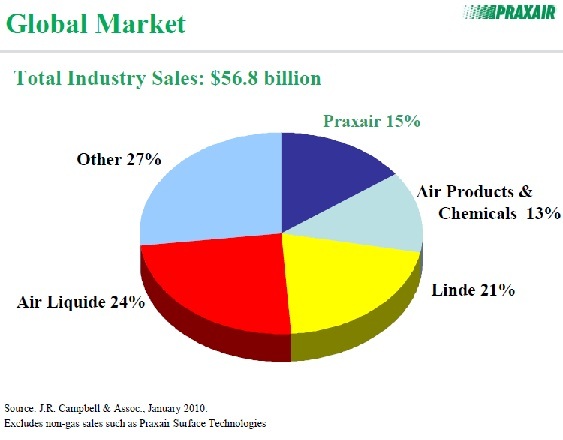 Praxair’s payout ratio is very good at 39 – company has room to increase dividends. The company has very good 5-year average dividend growth at an annualized rate of 17.31%. Earnings also showed a consistent growth rate of 12.75% in the last 5 years. The overall quantitative rating or the ‘OFB Factor’ came in at 7.12/10, which is well above average. Praxair Inc. has an enterprise value of $33.69B and a forward PE of 17.38. Praxair’s revenue came down significantly in the last year as the company felt the impact of the recessionary environment worldwide. Praxair is expected to grow revenue in the high single-digit range for the next two years, hinging on economic rebound. Praxair’s sales projections incorporate achieving a CAGR of 14% in the emerging market while continuing modest growth in other markets thereby increasing sales in emerging markets from the current 35% range to 45% in the next 5 years. In many of these markets Praxair’s advantage is being the first-mover and with it the chance of succeeding is high although associated risks abound. Praxair has a PEG ratio of 1.86, which indicates valuation is high. Our quantitative analysis showed the company as having a ‘Well Above Average’ rating. Although most of our other checks showed green lights, valuation is high and we recommend adding Praxair to the watch list and consider purchase when the share price gets cheaper.